The ISS serves as a microgravity and space environment research laboratory in which crew members conduct experiments in biology, human biology, physics, astronomy, meteorology, and other fields. The station is suited for the testing of spacecraft systems and equipment required for missions to the Moon and Mars. The ISS maintains an orbit with an altitude of between 330 and 435 km (205 and 270 mi) by means of reboost manoeuvres using the engines of the Zvezda module or visiting spacecraft. It circles the Earth in roughly 92 minutes and completes 15.5 orbits per day. The ISS programme is a joint project between five participating space agencies: NASA (United States), Roscosmos (Russia), JAXA (Japan), ESA (Europe), and CSA (Canada). The ownership and use of the space station is established by intergovernmental treaties and agreements. The station is divided into two sections, the Russian Orbital Segment (ROS) and the United States Orbital Segment (USOS), which is shared by many nations. As of January 2018[update], operations of the American segment were funded until 2025. Roscosmos has endorsed the continued operation of ISS through 2024, but has proposed using elements of the Russian segment to construct a new Russian space station called OPSEK. The ISS is the ninth space station to be inhabited by crews, following the Soviet and later Russian Salyut, Almaz, and Mir stations as well as Skylab from the US. The station has been continuously occupied for 18 years and 174 days since the arrival of Expedition 1 on 2 November 2000. This is the longest continuous human presence in low Earth orbit, having surpassed the previous record of 9 years and 357 days held by Mir. It has been visited by astronauts, cosmonauts and space tourists from 18 different nations. After the American Space Shuttle programme ended in 2011, Soyuz rockets became the only provider of transport for astronauts at the ISS. The station is serviced by a variety of visiting spacecraft: the Russian Soyuz and Progress, the American Dragon and Cygnus, the Japanese H-II Transfer Vehicle, and formerly the American Space Shuttle and the European Automated Transfer Vehicle. The Dragon spacecraft allows the return of pressurised cargo to Earth (downmass), which is used for example to repatriate scientific experiments for further analysis. The Soyuz return capsule has minimal downmass capability next to the astronauts. As of 14 March 2019[update], 236 people from 18 countries had visited the space station, many of them multiple times. The United States sent 149 people, Russia sent 47, nine were Japanese, eight were Canadian, five were Italian, four were French, three were German, and there were one each from Belgium, Brazil, Denmark, Kazakhstan, Malaysia, the Netherlands, South Africa, South Korea, Spain, Sweden, and the United Kingdom. The ISS simplifies individual experiments by eliminating the need for separate rocket launches and research staff. The wide variety of research fields include astrobiology, astronomy, human research including space medicine and life sciences, physical sciences, materials science, space weather, and weather on Earth (meteorology). Scientists on Earth have access to the crew's data and can modify experiments or launch new ones, which are benefits generally unavailable on unmanned spacecraft. Crews fly expeditions of several months' duration, providing approximately 160-man-hours per week of labour with a crew of 6. The space environment is hostile to life. Unprotected presence in space is characterised by an intense radiation field (consisting primarily of protons and other subatomic charged particles from the solar wind, in addition to cosmic rays), high vacuum, extreme temperatures, and microgravity. Some simple forms of life called extremophiles, as well as small invertebrates called tardigrades can survive in this environment in an extremely dry state through desiccation. First Orbit is a feature-length documentary film about Vostok 1, the first manned space flight around the Earth. By matching the orbit of the International Space Station to that of Vostok 1 as closely as possible, in terms of ground path and time of day, documentary filmmaker Christopher Riley and ESA astronaut Paolo Nespoli were able to film the view that Yuri Gagarin saw on his pioneering orbital space flight. This new footage was cut together with the original Vostok 1 mission audio recordings sourced from the Russian State Archive. Nespoli, during Expedition 26/27, filmed the majority of the footage for this documentary film, and as a result is credited as its director of photography. The film was streamed through the website firstorbit.org in a global YouTube premiere in 2011, under a free licence. In May 2013, commander Chris Hadfield shot a music video of David Bowie's "Space Oddity" on board the station; the film was released on YouTube. It was the first music video ever to be filmed in space. In November 2017, while participating in Expedition 52/53 on the ISS, Paolo Nespoli made two recordings (one in English the other in his native Italian) of his spoken voice, for use on Wikipedia articles. These were the first content made specifically for Wikipedia, in space. Since the International Space Station is a multi-national collaborative project, the components for in-orbit assembly had to be manufactured in various factories around the world. The U.S. Modules (Destiny and Unity) as well as the Integrated Truss Structure and solar arrays were fabricated at the Marshall Space Flight Center and the Michoud Assembly Facility, beginning in the mid 1990s. The modules were delivered to the Operations and Checkout Building, and the Space Station Processing Facility at Kennedy Space Center for final assembly and processing for launch. Steel and aluminium sections of the truss were part contracted by Alcoa and ArcelorMittal USA, along with Boeing. Russian modules - Zarya and Zvezda for example, were manufactured at the Khrunichev State Research and Production Space Center in Moscow. Zvezda was initially manufactured in 1985 as a component for Mir-2, but was never launched and instead became the ISS Service Module. The European Space Agency Columbus module was manufactured at the European Space Research and Technology Centre (ESTEC) in the Netherlands, along with many other contractors throughout Europe. The other ESA-built modules - Harmony and Tranquility, as well as the Leonardo MPLM and the Cupola, were initially manufactured at the Thales Alenia Space factory, located at the Cannes Mandelieu Space Center in Cannes, France. The structural steel hulls of the modules were transported by aircraft to the Kennedy Space Center SSPF for launch processing. The Japanese Experiment Module Kibo, was fabricated in various technology manufacturing facilities in Japan, at the NASDA (now JAXA) Tanegashima Space Center and the Institute of Space and Astronautical Science. The Kibo module was flown by aircraft to the KSC Space Station Processing Facility, along with the ESA Columbus laboratory for shuttle launch on STS-124 and STS-122 respectively. The Mobile Servicing System - consisting of the Canadarm-2 and the Dextre grapple fixture, were manufactured at various factories in Canada and the United States. The mobile base system - the connecting framework for Canadarm-2 mounted on rails, was built by Northrop Grumman in Carpinteria, CA. 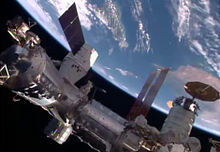 The Canadarm-2 and Dextre was made by MDA Space Missions, a satellite and aerospace factory in Brampton Ontario, under contract by the Canadian Space Agency and NASA. Assembly resumed in 2006 with the arrival of STS-115 with Atlantis, which delivered the station's second set of solar arrays. Several more truss segments and a third set of arrays were delivered on STS-116, STS-117, and STS-118. As a result of the major expansion of the station's power-generating capabilities, more pressurised modules could be accommodated, and the Harmony node and Columbus European laboratory were added. These were soon followed by the first two components of Kibō. In March 2009, STS-119 completed the Integrated Truss Structure with the installation of the fourth and final set of solar arrays. The final section of Kibō was delivered in July 2009 on STS-127, followed by the Russian Poisk module. 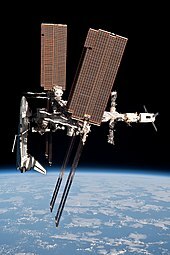 The third node, Tranquility, was delivered in February 2010 during STS-130 by the Space Shuttle Endeavour, alongside the Cupola, followed in May 2010 by the penultimate Russian module, Rassvet. Rassvet was delivered by Space Shuttle Atlantis on STS-132 in exchange for the Russian Proton delivery of the Zarya module in 1998 which had been funded by the United States. The last pressurised module of the USOS, Leonardo, was brought to the station by Discovery on her final flight, STS-133, in February 2011. The Alpha Magnetic Spectrometer was delivered by Endeavour on STS-134 the same year. As of June 2011[update], the station consisted of 15 pressurised modules and the Integrated Truss Structure. Five modules are still to be launched, including the Nauka with the European Robotic Arm, the Uzlovoy Module, and two power modules called NEM-1 and NEM-2. As of March 2019[update], Russia's future primary research module Nauka is set to launch in the summer of 2020, along with the European Robotic Arm which will be able to relocate itself to different parts of the Russian modules of the station. After the Nauka module is attached, the Uzlovoy Module will be attached to one of its docking ports. When completed, the station will have a mass of more than 400 tonnes (440 short tons). The gross mass of the station changes over time. The total launch mass of the modules on orbit is about 417,289 kg (919,965 lb) (as of 3 September 2011[update]). The mass of experiments, spare parts, personal effects, crew, foodstuff, clothing, propellants, water supplies, gas supplies, docked spacecraft, and other items add to the total mass of the station. Hydrogen gas is constantly vented overboard by the oxygen generators. Zarya (Russian: Заря́; lit. dawn), also known as the Functional Cargo Block or FGB (from the Russian "Функционально-грузовой блок", Funktsionalno-gruzovoy blok or ФГБ), was the first module of the International Space Station to be launched. The FGB provided electrical power, storage, propulsion, and guidance to the ISS during the initial stage of assembly. With the launch and assembly in orbit of other modules with more specialised functionality, Zarya is now primarily used for storage, both inside the pressurised section and in the externally mounted fuel tanks. Zarya is a descendant of the TKS spacecraft designed for the Soviet Salyut programme. The name Zarya was given to the FGB because it signified the dawn of a new era of international co-operation in space. Although it was built by a Russian company, it is owned by the United States. Zarya weighs 19,300 kg (42,500 lb), is 12.55 m (41.2 ft) long and 4.1 m (13 ft) wide, discounting solar arrays. Initially built to be the core of the cancelled Mir-2 space station, the hull of Zvezda was completed in February 1985, with major internal equipment installed by October 1986. The module was launched by a Proton-K rocket from Site 81/23 at Baikonur, on 12 July 2000. Zvezda is at the rear of the station according to its normal direction of travel and orientation, and its engines may be used to boost the station's orbit. Alternatively Russian and European spacecraft can dock to Zvezda's aft port and use their engines to boost the station. Columbus, the primary research facility for European payloads aboard the ISS, provides a generic laboratory as well as facilities specifically designed for biology, biomedical research and fluid physics. Several mounting locations are affixed to the exterior of the module, which provide power and data to external experiments such as the European Technology Exposure Facility (EuTEF), Solar Monitoring Observatory, Materials International Space Station Experiment, and Atomic Clock Ensemble in Space. A number of expansions are planned for the module to study quantum physics and cosmology. ESA's development of technologies on all the main areas of life support has been ongoing for more than 20 years and are/have been used in modules such as Columbus and the ATV. The German Aerospace Center manages ground control operations for Columbus and the ATV is controlled from the French CNES Toulouse Space Center. Not large enough for crew using spacesuits, the airlock on Kibō has a sliding drawer for external experiments. 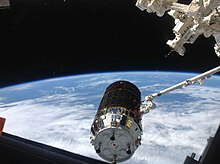 Kibō (Japanese: きぼう, "hope") is a laboratory and the largest ISS module. It is used for research in space medicine, biology, Earth observations, materials production, biotechnology and communications, and has facilities for growing plants and fish. During August 2011, the MAXI observatory mounted on Kibō, which uses the ISS's orbital motion to image the whole sky in the X-ray spectrum, detected for the first time the moment when a star was swallowed by a black hole. The laboratory contains 23 racks, including 10 experiment racks, and has a dedicated airlock for experiments. 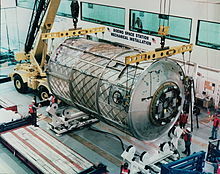 In a 'shirt sleeves' environment, crew attach an experiment to the sliding drawer within the airlock, close the inner, and then open the outer hatch. By extending the drawer and removing the experiment using the dedicated robotic arm, payloads are placed on the external platform. The process can be reversed and repeated quickly, allowing access to maintain external experiments without the delays caused by EVAs. The International Docking Adapter (IDA) is a spacecraft docking system adapter being developed to convert APAS-95 to the NASA Docking System (NDS) / International Docking System Standard (IDSS). IDA-2 was launched on SpaceX CRS-9 on 18 July 2016. It was attached and connected to PMA-2 during a spacewalk on 19 August 2016. Prichal, also known as the Uzlovoy Module (UM), or Node Module is a 4-metric-ton ball-shaped module that will allow docking of two scientific and power modules during the final stage of the station assembly, and provide the Russian segment additional docking ports to receive Soyuz MS and Progress MS spacecraft. UM is due to be launched in 2020. It will be integrated with a special version of the Progress cargo ship and launched by a standard Soyuz rocket. Progress would use its own propulsion and flight control system to deliver and dock the Node Module to the nadir (Earth-facing) docking port of the Nauka MLM/FGB-2 module. One port is equipped with an active hybrid docking port, which enables docking with the MLM module. The remaining five ports are passive hybrids, enabling docking of Soyuz and Progress vehicles, as well as heavier modules and future spacecraft with modified docking systems. The node module was conceived to serve as the only permanent element of the future Russian successor to the ISS, OPSEK. Equipped with six docking ports, the Node Module would serve as a single permanent core of the future station with all other modules coming and going as their life span and mission required. This would be a progression beyond the ISS and Russia's modular Mir space station, which are in turn more advanced than early monolithic first generation stations such as Skylab, and early Salyut and Almaz stations. The International Docking Adapter (IDA) is a spacecraft docking system adapter being developed to convert APAS-95 to the NASA Docking System (NDS)/ International Docking System Standard (IDSS). IDA-3 is scheduled to be launched on the SpaceX CRS-18 mission in May 2019. IDA-3 is being built mostly from spare parts to speed construction. The Bishop Airlock Module is a commercially-funded airlock module intended to be launched in 2019. The module is being built by NanoRacks and Boeing, and will be used to deploy CubeSats, small satellites, and other external payloads for NASA, CASIS, and other commercial and governmental customers. It is intended to be manifested with a Commercial Resupply Services mission. There are also smaller exposure facilities mounted directly to laboratory modules; the Kibō Exposed Facility serves as an external 'porch' for the Kibō complex, and a facility on the European Columbus laboratory provides power and data connections for experiments such as the European Technology Exposure Facility and the Atomic Clock Ensemble in Space. A remote sensing instrument, SAGE III-ISS, was delivered to the station in February 2017 aboard CRS-10, and the NICER experiment was delivered aboard CRS-11 in June 2017. 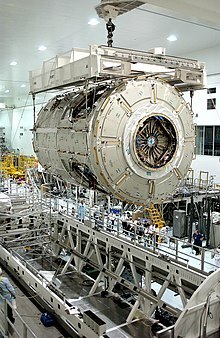 The largest scientific payload externally mounted to the ISS is the Alpha Magnetic Spectrometer (AMS), a particle physics experiment launched on STS-134 in May 2011, and mounted externally on the ITS. The AMS measures cosmic rays to look for evidence of dark matter and antimatter. The commercial Bartolomeo External Payload Hosting Platform, manufactured by Airbus, is due to launch in May 2019 aboard a commercial ISS resupply vehicle and be attached to the European Columbus module. It will provide a further 12 external payload slots, supplementing the eight on the ExPRESS Logistics Carriers, ten on Kibō, and four on Columbus. The system is designed to be robotically serviced and will require no astronaut intervention. It is named after Christopher Columbus's younger brother. The atmosphere on board the ISS is similar to the Earth's. Normal air pressure on the ISS is 101.3 kPa (14.7 psi); the same as at sea level on Earth. 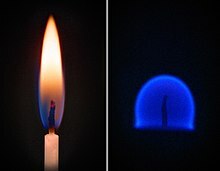 An Earth-like atmosphere offers benefits for crew comfort, and is much safer than a pure oxygen atmosphere, because of the increased risk of a fire such as that responsible for the deaths of the Apollo 1 crew. Earth-like atmospheric conditions have been maintained on all Russian and Soviet spacecraft. 2) for continuous power during the 35 minutes of every 90-minute orbit that it is eclipsed by the Earth. The batteries are recharged on the day side of the Earth. They have a 6.5-year lifetime (over 37,000 charge/discharge cycles) and will be regularly replaced over the anticipated 20-year life of the station. As of 2017[update], the nickel–hydrogen batteries are being replaced by lithium-ion batteries, which are expected to last until the end of the ISS program. The ISS is equipped with about 100 IBM/Lenovo ThinkPad and HP ZBook 15 laptop computers. The laptops have run Windows 95, Windows 2000, Windows XP, Windows 7, Windows 10 and Linux operating systems. Each computer is a commercial off-the-shelf purchase which is then modified for safety and operation including updates to connectors, cooling and power to accommodate the station's 28V DC power system and weightless environment. Heat generated by the laptops does not rise but stagnates around the laptop, so additional forced ventilation is required. Laptops aboard the ISS are connected to the station's wireless LAN via Wi-Fi and to the ground via Ku band. This provides speeds of 10 Mbit/s download and 3 Mbit/s upload from the station, comparable to home DSL connection speeds. Laptop hard drives have been known to fail occasionally, requiring manual replacement. Other computer failures include instances in 2001, 2007 and 2017; some of these failures have required EVAs to replace computers in externally mounted devices. Zarya and Unity were entered for the first time on 10 December 1998. Gennady Padalka, member of Expeditions 9, 19/20, 31/32, and 43/44, and Commander of Expedition 11, has spent more time in space than anyone else, a total of 878 days, 11 hours, and 29 minutes. Peggy Whitson has spent the most time in space of any American, totalling 665 days, 22 hours, and 22 minutes during her time on Expeditions 5, 16, and 50/51/52. Animation of ISS orbit from 14 September 2018 to 14 November 2018. Earth is not shown. Zvezda uses gyroscopes (reaction wheels) and thrusters to turn itself around. Gyroscopes do not require propellant, rather they use electricity to 'store' momentum in flywheels by turning in the opposite direction to the station's movement. The USOS has its own computer controlled gyroscopes to handle the extra mass of that section. When gyroscopes 'saturate', thrusters are used to cancel out the stored momentum. 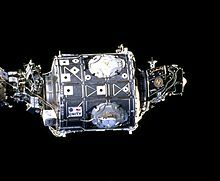 During Expedition 10, an incorrect command was sent to the station's computer, using about 14 kilograms of propellant before the fault was noticed and fixed. When attitude control computers in the ROS and USOS fail to communicate properly, it can result in a rare 'force fight' where the ROS GNC computer must ignore the USOS counterpart, which has no thrusters. When an ATV, NASA Shuttle, or Soyuz is docked to the station, it can also be used to maintain station attitude such as for troubleshooting. Shuttle control was used exclusively during installation of the S3/S4 truss, which provides electrical power and data interfaces for the station's electronics. Roscosmos's Mission Control Center at Korolyov, Moscow Oblast, controls the Russian Orbital Segment which handles Guidance, Navigation and Control for the entire Station, in addition to individual Soyuz and Progress missions. ESA's Columbus Control Centre at the German Aerospace Center in Oberpfaffenhofen, Germany, manages the European Columbus research laboratory. Spare parts are called ORUs; some are externally stored on pallets called ELCs and ESPs. While anchored on the end of the OBSS during STS-120, astronaut Scott Parazynski performs makeshift repairs to a US solar array which damaged itself when unfolding. The four Main Bus Switching Units (MBSUs, located in the S0 truss), control the routing of power from the four solar array wings to the rest of the ISS. In late 2011 MBSU-1, while still routing power correctly, ceased responding to commands or sending data confirming its health, and was scheduled to be swapped out at the next available EVA. In each MBSU, two power channels feed 160V DC from the arrays to two DC-to-DC power converters (DDCUs) that supply the 124V power used in the station. A spare MBSU was already on board, but the 30 August 2012 EVA failed to be completed when a bolt being tightened to finish installation of the spare unit jammed before the electrical connection was secured. The loss of MBSU-1 limited the station to 75% of its normal power capacity, requiring minor limitations in normal operations until the problem could be addressed. A wide variety of crewed and uncrewed spacecraft have supported the station's activities. More than 70 Progress spacecraft, including M-MIM2 and M-SO1 which installed modules, and more than 50 crewed Soyuz spacecraft have flown to the ISS. The Space Shuttle flew there 37 times before retirement. There have been 5 European ATV, 7 Japanese HTV 'Kounotori', 15 SpaceX Dragon and 10 Orbital ATK Cygnus successful resupply missions. Dragon and Cygnus cargo vessels were docked at the ISS together for the first time in April 2016. Soyuz MS-10 (56S) aborted shortly after launch on 11 October 2018; it was carrying two crew members slated to join Expedition 57, who subsequently landed safely. The impact of this failure and subsequent investigation on the ISS crew schedule was not initially clear. The Expedition 57 crew needed to depart by mid-December in Soyuz MS-09 due to the limited on-orbit lifespan of "about 200 days" of the Soyuz capsule, or no later than early January allowing for a small margin on the lifespan. NASA would have attempted to avoid de-crewing the ISS; commanding the station from the ground is feasible if necessary. On 23 October 2018, NASA Administrator Bridenstine announced that Soyuz flights to the ISS were expected to resume in December 2018. The Soyuz MS-11 spacecraft commanded by cosmonaut Oleg Kononenko, carrying him and flight engineers Anne McClain and David Saint-Jacques, successfully launched and docked to the ISS on 3 December 2018; the Expedition 57 crew departed on 20 December and Expedition 58 began as a three-person increment. The Progress M-14M resupply vehicle as it approaches the ISS in 2012. Over 50 unpiloted Progress spacecraft have been sent with supplies during the lifetime of the station. Most of the food aboard is vacuum sealed in plastic bags; cans are rare because they are heavy and expensive to transport. Preserved food is not highly regarded by the crew and taste is reduced in microgravity, therefore effort is made to make the food more palatable, such as using more spices than in regular cooking. The crew looks forward to the arrival of any ships from Earth as they bring fresh fruit and vegetables. Care is taken that foods do not create crumbs, and sauces are often used to avoid contaminating station equipment. Each crew member has individual food packages and cooks them using the on-board galley. The galley features two food warmers, a refrigerator which was added in November 2008, and a water dispenser that provides both heated and unheated water. Drinks are provided as dehydrated powder that is mixed with water before consumption. Drinks and soups are sipped from plastic bags with straws, while solid food is eaten with a knife and fork attached to a tray with magnets to prevent them from floating away. Any food that floats away, including crumbs, must be collected to prevent it from clogging the station's air filters and other equipment. On 12 April 2019, NASA reported medical results, from the Astronaut Twin Study, where one astronaut twin spent a year in space on the International Space Station, while the other twin spent the year on Earth, which demonstrated several long-lasting changes, including those related to alterations in DNA and cognition, when one twin was compared with the other. A study of the longest spaceflight concluded that the first three weeks are a critical period where attention is adversely affected because of the demand to adjust to the extreme change of environment. Skylab's three crews remained one, two, and three months, respectively; long-term crews on Salyut 6, Salyut 7, and the ISS last about five to six months, and Mir's expeditions often lasted longer. The ISS working environment includes further stress caused by living and working in cramped conditions with people from very different cultures who speak a different language. First-generation space stations had crews who spoke a single language; second- and third-generation stations have crew from many cultures who speak many languages. Astronauts must speak English and Russian, and knowing additional languages is even better. 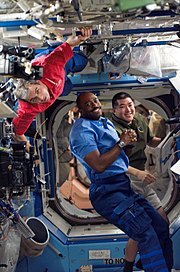 The ISS is unique because visitors are not classed automatically into 'host' or 'guest' categories as with previous stations and spacecraft, and may not suffer from feelings of isolation in the same way. Crew members with a military pilot background and those with an academic science background or teachers and politicians may have problems understanding each other's jargon and worldview. Due to the lack of gravity, confusion often occurs. Even though there is no up and down in space, some crew members feel like they are oriented upside down. They may also have difficulty measuring distances. This can cause problems like getting lost inside the space station, pulling switches in the wrong direction or misjudging the speed of an approaching vehicle during docking. Sleep is disturbed on the ISS regularly because of mission demands, such as incoming or departing ships. Sound levels in the station are unavoidably high. Because the atmosphere is unable to thermosiphon, fans are required at all times to allow processing of the atmosphere which would stagnate in the freefall (zero-g) environment. Hazardous moulds which can foul air and water filters may develop aboard space stations. They can produce acids which degrade metal, glass, and rubber. They can also be harmful for the crew's health. Microbiological hazards have led to a development of the LOCAD-PTS that can identify common bacteria and moulds faster than standard methods of culturing, which may require a sample to be sent back to Earth. As of 2012[update], 76 types of unregulated micro-organisms have been detected on the ISS. 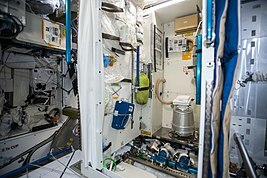 Researchers in 2018 reported, after detecting the presence of five Enterobacter bugandensis bacterial strains on the ISS, none pathogenic to humans, that microorganisms on ISS should be carefully monitored to continue assuring a medically healthy environment for astronauts. In April 2019, NASA reported that a comprehensive study of microorganisms and fungi present on the International Space Station has been conducted. The results can be useful in improving health and safety conditions for astronauts. Ballistic panels, also called micrometeorite shielding, are incorporated into the station to protect pressurised sections and critical systems. The type and thickness of these panels depend on their predicted exposure to damage. The station's shields and structure have different designs on the ROS and the USOS. On the USOS, Whipple shields are used. The US segment modules consist of an inner layer made from 1.5 cm thick aluminum, a 10cm thick intermediate layers of Kevlar and Nextel, and an outer layer of stainless steel, which causes objects to shatter into a cloud before hitting the hull, thereby spreading the energy of impact. On the ROS, a carbon plastic honeycomb screen is spaced from the hull, an aluminium honeycomb screen is spaced from that, with a screen-vacuum thermal insulation covering, and glass cloth over the top. 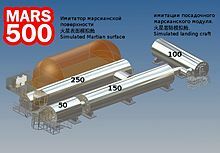 According to a 2009 report, Space Corporation Energia is considering methods to remove from the station some modules of the Russian Orbital Segment when the end of mission is reached and use them as a basis for a new station, called the Orbital Piloted Assembly and Experiment Complex (OPSEK). The modules under consideration for removal from the current ISS include the Multipurpose Laboratory Module (Nauka), currently scheduled to be launched in November 2019, and other Russian modules which are planned to be attached to Nauka afterwards. Those modules would be within their useful lives in 2020 or 2024. The report presents a statement from an unnamed Russian engineer that, based on the experience from Mir, a 30-year life should be possible, except for micrometeorite damage, because the Russian modules have been built with on-orbit refurbishment in mind. According to the Outer Space Treaty, the United States and Russia are legally responsible for all modules they have launched. In ISS planning, NASA examined options including returning the station to Earth via shuttle missions (deemed too expensive, as the USOS is not designed for disassembly and this would require at least 27 shuttle missions), natural orbital decay with random reentry similar to Skylab, boosting the station to a higher altitude (which would delay reentry) and a controlled targeted de-orbit to a remote ocean area. In February 2015, Roscosmos announced that it would remain a part of the ISS programme until 2024. Nine months earlier—in response to US sanctions against Russia over the annexation of Crimea—Russian Deputy Prime Minister Dmitry Rogozin had stated that Russia would reject a US request to prolong the orbiting station's use beyond 2020, and would only supply rocket engines to the US for non-military satellite launches. Regarding extending the ISS, on 15 November 2016 General Director Vladimir Solntsev of RSC Energia stated "Maybe the ISS will receive continued resources. Today we discussed the possibility of using the station until 2028," and "Much will depend on the political moments in relations with the Americans, with the new administration. It will be discussed." There have also been suggestions that the station could be converted to commercial operations after it is retired by government entities. In July 2018, U.S Senate member Ted Cruz introduced the Space Frontier Act of 2018, intended to extend operations of the ISS to 2030. This bill was unanimously approved in the Senate, but failed to pass in the U.S. House. In September 2018, U.S. House member Brian Babin introduced the Leading Human Spaceflight Act, intended to extend operations of the ISS to 2030, and was confirmed in December 2018. Simulated motion of the ISS over North America, with 12 second motion markers and vertical lines projecting down to the surface of Earth. The ISS is shown red when it enters the earth's shadow and cannot be seen from Earth. It is only easily visible in the twilight interval of night just after sunset, or before sunrise. The ISS is visible to the naked eye as a slow-moving, bright white dot because of reflected sunlight, and can be seen in the hours after sunset and before sunrise, when the station remains sunlit but the ground and sky are dark. The ISS takes about 10 minutes to pass from one horizon to another, and will only be visible part of that time because of moving into or out of the Earth's shadow. Because of the size of its reflective surface area, the ISS is the brightest artificial object in the sky, excluding flares, with an approximate maximum magnitude of −4 when overhead (similar to Venus). The ISS, like many satellites including the Iridium constellation, can also produce flares of up to 8 or 16 times the brightness of Venus as sunlight glints off reflective surfaces. The ISS is also visible in broad daylight, albeit with a great deal more difficulty. Tools are provided by a number of websites such as Heavens-Above (see Live viewing below) as well as smartphone applications that use orbital data and the observer's longitude and latitude to indicate when the ISS will be visible (weather permitting), where the station will appear to rise, the altitude above the horizon it will reach and the duration of the pass before the station disappears either by setting below the horizon or entering into Earth's shadow. In November 2012 NASA launched its "Spot the Station" service, which sends people text and email alerts when the station is due to fly above their town. The station is visible from 95% of the inhabited land on Earth, but is not visible from extreme northern or southern latitudes. Using a telescope-mounted camera to photograph the station is a popular hobby for astronomers, while using a mounted camera to photograph the Earth and stars is a popular hobby for crew. The use of a telescope or binoculars allows viewing of the ISS during daylight hours. Some amateur astronomers also use telescopic lenses to photograph the ISS while it transits the sun, sometimes doing so during an eclipse (and so the Sun, Moon, and ISS are all positioned approximately in a single line). One example is during the 21 August solar eclipse, where at one location in Wyoming, images of the ISS were captured during the eclipse. Similar images were captured by NASA from a location in Washington. Parisian engineer and astrophotographer Thierry Legault, known for his photos of spaceships transiting the Sun, travelled to Oman in 2011 to photograph the Sun, Moon and space station all lined up. Legault, who received the Marius Jacquemetton award from the Société astronomique de France in 1999, and other hobbyists, use websites that predict when the ISS will transit the Sun or Moon and from what location those passes will be visible. ^ Privately funded travellers who have objected to the term include Dennis Tito, the first such traveller (Associated Press, 8 May 2001), Mark Shuttleworth, founder of Ubuntu (Associated Press, The Spokesman Review, 6 January 2002, p. A4), Gregory Olsen and Richard Garriott. Canadian astronaut Bob Thirsk said the term does not seem appropriate, referring to his crewmate, Guy Laliberté, founder of Cirque du Soleil. Anousheh Ansari denied being a tourist and took offence at the term. ^ ESA director Jörg Feustel-Büechl said in 2001 that Russia had no right to send 'amateurs' to the ISS. A 'stand-off' occurred at the Johnson Space Centre between Commander Talgat Musabayev and NASA manager Robert Cabana. Cabana refused to train Dennis Tito, a member of Musabayev's crew along with Yuri Baturin. The commander argued that Tito had trained 700 hours in the last year and was as qualified as any NASA astronaut, and refused to allow his crew to be trained on the American portions of the station without Tito. Cabana stated training could not begin, and the commander returned with his crew to their hotel. ^ a b Garcia, Mark (9 May 2018). "About the Space Station: Facts and Figures". NASA. Retrieved 21 June 2018. ^ "Space to Ground: Friending the ISS: 06/03/2016". YouTube.com. NASA. 3 June 2016. ^ a b c d e f g h i j Peat, Chris (28 September 2018). "ISS – Orbit". Heavens-Above. Retrieved 28 September 2018. ^ a b c d NASA (18 February 2010). "On-Orbit Elements" (PDF). NASA. Archived from the original (PDF) on 29 October 2009. Retrieved 19 June 2010. ^ "STS-132 Press Kit" (PDF). NASA. 7 May 2010. Retrieved 19 June 2010. ^ "STS-133 FD 04 Execute Package" (PDF). NASA. 27 February 2011. Retrieved 27 February 2011. ^ "First crew starts living and working on the International Space Station". European Space Agency. 31 October 2000. ^ "Oct. 31, 2000, Launch of First Crew to International Space Station". NASA. 28 October 2015. ^ "NASA Sightings Help Page". Spaceflight.nasa.gov. 30 November 2011. Retrieved 1 May 2012. ^ a b c d Catchpole, John E. (17 June 2008). The International Space Station: Building for the Future. Springer-Praxis. ISBN 978-0-387-78144-0. ^ a b c "International Space Station Overview". ShuttlePressKit.com. 3 June 1999. Retrieved 17 February 2009. ^ a b c d e "Fields of Research". NASA. 26 June 2007. Archived from the original on 23 January 2008. ^ a b "Getting on Board". NASA. 26 June 2007. Archived from the original on 8 December 2007. ^ a b "ISS Research Program". NASA. Archived from the original on 13 February 2009. Retrieved 27 February 2009. ^ a b "Current ISS Tracking data". NASA. 15 December 2008. Retrieved 28 January 2009. ^ a b c d e f g h i j k l m n o Gary Kitmacher (2006). Reference Guide to the International Space Station. Canada: Apogee Books. pp. 71–80. ISBN 978-1-894959-34-6. ISSN 1496-6921. ^ "International Space Station legal framework". European Space Agency (ESA). 19 November 2013. Retrieved 21 February 2015. ^ a b Grush, Loren (24 January 2018). "Trump administration wants to end NASA funding for the International Space Station by 2025". The Verge. Retrieved 24 April 2018. ^ Clark, Stephen (11 March 2010). "Space station partners set 2028 as certification goal". Spaceflight Now. Retrieved 1 June 2011. ^ "Canada's space station commitment renewed". CBC News. 29 February 2012. ^ a b de Selding, Peter B. (25 February 2015). "Russia — and Its Modules — To Part Ways with ISS in 2024". Space News. Retrieved 26 February 2015. ^ Bodner, Matthew (17 November 2014). "Russia May Be Planning National Space Station to Replace ISS". The Moscow Times. Retrieved 3 March 2015. ^ Visitors to the Station by Country NASA, 2019-03-14. ^ "Memorandum of Understanding Between the National Aeronautics and Space Administration of the United States of America and the Russian Space Agency Concerning Cooperation on the Civil International Space Station". NASA. 29 January 1998. Retrieved 19 April 2009. ^ Payette, Julie (10 December 2012). "Research and Diplomacy 350 Kilometers above the Earth: Lessons from the International Space Station". Science & Diplomacy. 1 (4). ^ "National Space Policy of the United States of America" (PDF). White House; USA Federal government. Retrieved 20 July 2011. ^ "Nations Around the World Mark 10th Anniversary of International Space Station". NASA. 17 November 2008. Retrieved 6 March 2009. ^ a b c Oberg, James (2005). "International Space Station". World Book Online Reference Center. Retrieved 3 April 2016. ^ "Monitor of All-sky X-ray Image (MAXI)". JAXA. 2008. Retrieved 12 March 2011. ^ "The International Space Station: life in space". Science in School. 10 December 2008. Retrieved 17 February 2009. ^ NASA – AMS to Focus on Invisible Universe. Nasa.gov (18 March 2011). Retrieved 8 October 2011. ^ In Search of Antimatter Galaxies – NASA Science. Science.nasa.gov (16 May 2011). Retrieved 8 October 2011. ^ Staff (3 April 2013). "First Result from the Alpha Magnetic Spectrometer Experiment". AMS Collaboration. Retrieved 3 April 2013. ^ Heilprin, John; Borenstein, Seth (3 April 2013). "Scientists find hint of dark matter from cosmos". Associated Press. Retrieved 3 April 2013. ^ Amos, Jonathan (3 April 2013). "Alpha Magnetic Spectrometer zeroes in on dark matter". BBC News. Retrieved 3 April 2013. ^ Perrotto, Trent J.; Byerly, Josh (2 April 2013). "NASA TV Briefing Discusses Alpha Magnetic Spectrometer Results". NASA. Retrieved 3 April 2013. ^ Overbye, Dennis (3 April 2013). "New Clues to the Mystery of Dark Matter". The New York Times. Retrieved 3 April 2013. ^ G Horneck, DM Klaus & RL Mancinelli (March 2010). "Space Microbiology, section Space Environment (p. 122)" (PDF). Microbiology and Molecular Biology Reviews. Archived from the original (PDF) on 30 August 2011. Retrieved 4 June 2011. ^ Jonathan Amos (23 August 2010). "Beer microbes live 553 days outside ISS". BBC News. Retrieved 4 June 2011. ^ a b c Jay Buckey (23 February 2006). Space Physiology. Oxford University Press USA. ISBN 978-0-19-513725-5. ^ List Grossman (24 July 2009). "Ion engine could one day power 39-day trips to Mars". New Scientist. Retrieved 8 January 2010. ^ Brooke Boen (1 May 2009). "Advanced Diagnostic Ultrasound in Microgravity (ADUM)". NASA. Archived from the original on 29 October 2009. Retrieved 1 October 2009. ^ Rao, Sishir; et al. (May 2008). "A Pilot Study of Comprehensive Ultrasound Education at the Wayne State University School of Medicine". Journal of Ultrasound in Medicine. 27 (5): 745–749. doi:10.7863/jum.2008.27.5.745. PMID 18424650. ^ Fincke, E. Michael; et al. (February 2005). "Evaluation of Shoulder Integrity in Space: First Report of Musculoskeletal US on the International Space Station". Radiology. 234 (2): 319–322. doi:10.1148/radiol.2342041680. PMID 15533948. ^ May, Sandra, ed. (15 February 2012). "What Is Microgravity?". NASA Knows! (Grades 5-8). Retrieved 3 September 2018. ^ "European Users Guide to Low Gravity Platforms". European Space Agency. 6 December 2005. Archived from the original on 2 April 2013. Retrieved 22 March 2013. ^ "Materials Science 101". Science@NASA. 15 September 1999. Archived from the original on 14 June 2009. Retrieved 18 June 2009. ^ "Mars500 study overview". ESA. 4 June 2011. ^ "Space station may be site for next mock Mars mission". New Scientist. 4 November 2011. ^ "The Sustainable Utilisation of the ISS Beyond 2015" (PDF). International Astronautical Congress. Archived from the original (PDF) on 26 April 2012. Retrieved 15 December 2011. ^ de Selding, Peter B. (3 February 2010). "ESA Chief Lauds Renewed U.S. Commitment to Space Station, Earth Science". Space News. ^ "Charlie Bolden". space.com. 4 June 2011. ^ Gro Mjeldheim Sandal; Dietrich Manzey (December 2009). "Cross-cultural issues in space operations: A survey study among ground personnel of the European Space Agency". Acta Astronautica. 65 (11–12): 1520–1529. Bibcode:2009AcAau..65.1520S. doi:10.1016/j.actaastro.2009.03.074. ^ "Online Materials". European Space Agency. Retrieved 3 April 2016. ^ "ISS 3-D Teaching Tool: Spaceflight Challenge I". European Space Agency. 24 May 2011. Retrieved 8 October 2011. ^ Building Peace in Young Minds through Space Education (PDF). Committee on the Peaceful Uses of Outer Space, 53rd Session. June 2010. Vienna, Austria. JAXA. June 2010. ^ "JAXA Spaceflight Seeds Kids I : Spaceflight Sunflower seeds – Let's make them flower! and learn freshly the Earth environment just by contrast with the Space one". JAXA. 2006. Archived from the original on 18 March 2012. ^ "JAXA Seeds in Space I : Let's Cultivate Spaceflight Asagao (Japanese morning glory), Miyako-gusa (Japanese bird's foot trefoil) Seeds and Identify the Mutants!". JAXA. 2006. Archived from the original on 18 March 2012. ^ Keiji Murakami (14 October 2009). "JEM Utilization Overview" (PDF). JAXA. Steering Committee for the Decadal Survey on Biological and Physical Sciences in Space. ^ Tetsuo Tanaka. "Kibo: Japan's First Human Space Facility". JAXA. Retrieved 8 October 2011. ^ "Amateur Radio on the International Space Station". 6 June 2011. Archived from the original on 27 May 2011. Retrieved 10 June 2011. ^ Riley, Christopher (11 April 2011). "What Yuri Gagarin saw: First Orbit film to reveal the view from Vostok 1". The Guardian. London. ^ "Yuri Gagarin's First Orbit – FAQs". Firstorbit.org. Retrieved 1 May 2012. ^ Warr, Philippa (13 May 2013). "Commander Hadfield bids farewell to ISS with Reddit-inspired Bowie cover". Wired.co.uk. Archived from the original on 12 October 2013. Retrieved 22 October 2013. ^ Davis, Lauren. "Chris Hadfield sings 'Space Oddity' in the first music video in space". io9. ^ Mabbett, Andy. "Close encounters of the Wikipedia kind: Astronaut is first to specifically contribute to Wikipedia from space – Wikimedia Blog". [Wikimedia foundation. Retrieved 4 December 2017. ^ Petris, Antonella (1 December 2017). "Primo contributo 'extraterrestre' su Wikipedia: è di Nespoli". Meteo Web (in Italian). Retrieved 4 December 2017. ^ Harbaugh, Jennifer, ed. (19 February 2016). "Manufacturing Key Parts of the International Space Station: Unity and Destiny". NASA. Retrieved 15 February 2019. ^ "Companies involved with ISS". European Space Agency. 19 July 2004. ^ a b "The ISS to Date". NASA. 9 March 2011. Retrieved 21 March 2011. ^ Derek Hassman, NASA Flight Director (1 December 2002). "MCC Answers". NASA. Retrieved 14 June 2009. ^ "STS-88". Science.ksc.nasa.gov. Retrieved 19 April 2011. ^ Brad Liston (2 November 2000). "Upward Bound: Tales of Space Station Alpha". Time. Retrieved 5 August 2010. ^ "Interview with Yuri Semenov, general designer of Space Rocket corporation Energy". Voice of Russia. 21 March 2001. Archived from the original on 18 March 2012. Retrieved 5 October 2010. ^ "STS-92". Science.ksc.nasa.gov. Retrieved 19 April 2011. ^ Chris Bergin (26 July 2005). "Discovery launches—The Shuttle is back". NASASpaceflight.com. Retrieved 6 March 2009. ^ "Mini-Research Module 1 (MIM1) Rassvet (MRM-1)". Russianspaceweb.com. Archived from the original on 25 August 2011. Retrieved 12 July 2011. ^ "STS-133". NASA. Retrieved 1 September 2014. ^ "STS-134". NASA. Retrieved 1 September 2014. ^ "Russia works on a new-generation space module". Russianspaceweb.com. Archived from the original on 8 April 2016. Retrieved 29 November 2015. ^ "NASA – The ISS to Date (03/09/2011)". Nasa.gov. Retrieved 12 July 2011. ^ "DLR – International Space Station ISS – From Cold War to international cooperation – the story of the ISS". Dlr.de. Retrieved 1 May 2012. ^ "Third Generation Soviet Space Systems". Astronautix.com. Archived from the original on 18 June 2012. Retrieved 1 May 2012. ^ "A History of U.S. Space Stations" (PDF). Spaceflight.nasa.gov. Retrieved 10 August 2017. ^ "Space Station | Russian Space History". Pbs.org. Retrieved 1 May 2012. ^ Cáceres, Marco (14 July 2014). "When Keeping the Space Station Open Suddenly Became a Cause Célèbre". The Huffington Post. Retrieved 11 September 2016. ^ a b Lewis, Cathleen (19 August 2015). "Zvezda Service Module Celebrates 15 Years in Orbit". Smithsonian National Air and Space Museum. Retrieved 11 September 2016. 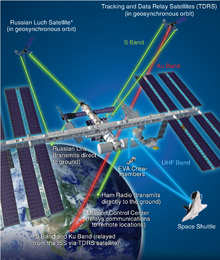 ^ a b c "DMS-R: ESA's Data Management System for the Russian Segment of the ISS". ^ Oberg, James (1 May 2007). "Space station lights its 'big engines'". NBC News. Retrieved 11 September 2016. ^ Pappalardo, Joe (1 March 2007). "How does the International Space Station dodge space junk?". Air & Space/Smithsonian. Retrieved 11 September 2016. ^ "NASA—US Destiny Laboratory". NASA. 26 March 2007. Retrieved 26 June 2007. ^ "Space Station Extravehicular Activity". NASA. 4 April 2004. Retrieved 11 March 2009. ^ "Mir close calls". Russianspaceweb.com. Retrieved 1 May 2012. ^ "Pirs Docking Compartment". NASA. 10 May 2006. Retrieved 28 March 2009. ^ Chris Bergin (10 January 2008). "PRCB plan STS-122 for NET Feb 7—three launches in 10–11 weeks". NASASpaceflight.com. Retrieved 12 January 2008. ^ "Columbus laboratory". European Space Agency (ESA). 10 January 2009. Retrieved 6 March 2009. ^ JAXA (30 March 2007). "Monitor of All-sky X-ray Image (MAXI): Experiment – Kibo Japanese Experimental Module – JAXA". Kibo.jaxa.jp. Archived from the original on 28 April 2012. Retrieved 1 May 2012. ^ "JAXA | Scientific paper in Nature using the Monitor of All-sky X-ray Image (MAXI) on Kibo and the Swift satellite (USA) observations – First observation of a massive black hole swallowing a star". Jaxa.jp. Retrieved 1 May 2012. ^ "Astronauts Bask in Spectacular Views From New Space Windows". Space.com. Retrieved 1 May 2012. ^ "First Photos: Space Station's Observation Deck Unveiled". National Geographic. 18 February 2010. Retrieved 1 May 2012. ^ "NASA Shuttle to Launch Luke Skywalker's Lightsaber". Space.com. 28 August 2007. Retrieved 1 May 2012. ^ NASA (18 May 2010). "STS-132 MCC Status Report #09". Retrieved 7 July 2010. ^ "Leonardo Attached to Space Station". ESA.int. 1 March 2011. Retrieved 11 June 2013. ^ Garcia, Mark (27 May 2015). "Module Relocated Prepping Station for Commercial Crew". NASA. Retrieved 27 May 2015. ^ Thales Alenia Space and ISS modules – Thales Alenia Space and ISS modules. Thalesaleniaspace-issmodules.com. Retrieved 8 October 2011. ^ Space Station User's Guide. SpaceRef (3 April 2001). Retrieved 8 October 2011. ^ Chris Gebhardt (5 August 2009). "STS-133 refined to a five crew, one EVA mission—will leave MPLM on ISS". NASASpaceflight.com. ^ Amos, Jonathan (29 August 2009). "Europe looks to buy Soyuz craft". BBC News. ^ "Shuttle Q&A Part 5". NASASpaceflight.com. 27 September 2009. Retrieved 12 October 2009. ^ "NASA to Test Bigelow Expandable Module on Space Station". NASA. 16 January 2013. Retrieved 17 January 2013. ^ Pearlman, Robert (10 April 2016). "SpaceX Dragon Arrives at Space Station, Delivers Inflatable Room Prototype". Space.com. Retrieved 19 April 2016. ^ Clark, Stephen (16 April 2016). "Expandable room installed on space station". Spaceflight Now. Retrieved 19 April 2016. ^ Garcia, Mark (28 May 2016). "BEAM Expanded To Full Size". NASA. ^ Harwood, William (16 January 2013). "Bigelow inflatable module bound for space station". Spaceflight Now. Retrieved 17 January 2013. ^ Palca, Joe (26 July 2017). "After A Year In Space, The Air Hasn't Gone Out Of NASA's Inflated Module". NPR. Retrieved 6 August 2017. ^ Morring, Frank (23 May 2012). "Russia Sees Moon Base As Logical Next Step". Aviation Week. Archived from the original on 12 November 2012. Retrieved 29 May 2012. ^ Zak, Anatoly (29 April 2014). "MLM (FGB-2)". Russian Space Web. Retrieved 14 May 2014. ^ Zak, Anatoly (22 March 2017). "This Russian ISS Module Has Been Delayed For a Decade and It's Still Not Ready to Fly". Popular Mechanics. Retrieved 21 September 2018. ^ Zak, Anatoly. "Node Module". RussianSpaceWeb.com. Archived from the original on 3 March 2016. Retrieved 7 January 2015. ^ "Строительство российского сегмента МКС завершится в 2022 году" [Building of the Russian segment of the ISS will be finished in 2022] (in Russian). RIA Novosti. 19 November 2018. Retrieved 20 November 2018. ^ S.P. Korolev RSC Energia – News. Energia.ru (13 January 2011). Retrieved 8 October 2011. ^ Node Module Archived 3 March 2016 at the Wayback Machine. Russianspaceweb.com. Retrieved 8 October 2011. ^ "NanoRacks, Boeing to Build First Commercial Airlock Module on International Space Station". NanoRacks. 6 February 2017. ^ Garcia, Mark (3 February 2017). "Progress Underway for First Commercial Airlock on Space Station". NASA. ^ "CAM – location?". NASA Spaceflight Forums. Retrieved 12 October 2009. ^ Tariq Malik (14 February 2006). "NASA Recycles Former ISS Module for Life Support Research". Space.com. Retrieved 11 March 2009. ^ "ICM Interim Control Module". U.S. Naval Center for Space Technology. Archived from the original on 8 February 2007. ^ "Russian Research Modules". Boeing. Retrieved 21 June 2009. ^ Anatoly Zak. "Russian segment of the ISS". russianspaceweb.com. Retrieved 3 October 2009. ^ "Spread Your Wings, It's Time to Fly". NASA. 26 July 2006. Retrieved 21 September 2006. ^ NASA (2008). "Consolidated Launch Manifest". NASA. Retrieved 8 July 2008. ^ "EXPRESS Racks 1 and 2 fact sheet". NASA. 12 April 2008. Retrieved 4 October 2009. ^ "Soyuz TMA-03M docks to ISS, returns station to six crewmembers for future ops". NASASpaceFlight.com. 23 December 2011. Retrieved 1 May 2012. ^ L. D. Welsch (30 October 2009). "EVA Checklist: STS-129 Flight Supplement" (PDF). NASA. ^ "Space Shuttle Mission: STS-131" (PDF). NASA. February 2011. ^ "Space Shuttle Mission: STS-134" (PDF). NASA. April 2011. ^ "HTV2: Mission Press Kit" (PDF). Japan Aerospace Exploration Agency. 20 January 2011. ^ "Exposed Facility:About Kibo". JAXA. 29 August 2008. Archived from the original on 3 August 2009. Retrieved 9 October 2009. ^ "NASA—European Technology Exposure Facility (EuTEF)". NASA. 6 October 2008. Archived from the original on 19 October 2008. Retrieved 28 February 2009. ^ "ESA—Columbus—European Technology Exposure Facility (EuTEF)". ESA. 13 January 2009. Retrieved 28 February 2009. ^ "Atomic Clock Ensemble in Space (ACES)". ESA. Archived from the original on 9 June 2009. Retrieved 9 October 2009. ^ Gebhardt, Christ (10 March 2017). "SpaceX science – Dragon delivers experiments for busy science period". NASASpaceFlight.com. Retrieved 11 January 2019. ^ Graham, William (3 June 2017). "Falcon 9 launches with CRS-11 Dragon on 100th 39A launch". NASASpaceFlight.com. Retrieved 11 January 2019. ^ "The Alpha Magnetic Spectrometer Experiment". CERN. 21 January 2009. Retrieved 6 March 2009. ^ Bergin, Chris (4 April 2013). "Endeavour's ongoing legacy: AMS-02 proving its value". NASASpaceFlight.com. Retrieved 11 January 2019. ^ "ESA and Airbus sign partnership agreement for new ISS commercial payload platform Bartolomeo". SpaceDaily. 9 February 2018. Retrieved 10 February 2018. ^ "Airbus and ESA to partner on Bartolomeo platform". Aerospace Technology. 8 February 2018. Retrieved 10 February 2018. ^ "ISS: Bartolomeo". eoPortal. European Space Agency. Retrieved 10 February 2018. ^ "Canadarm2 and the Mobile Servicing System". NASA. 8 January 2013. Retrieved 22 June 2015. ^ "Dextre, the International Space Station's Robotic Handyman". Canadian Space Agency. 18 April 2011. Retrieved 22 June 2015. ^ "Mobile Base System". Canadian Space Agency. Retrieved 22 June 2015. ^ a b "Space Shuttle Mission STS-134: Final Flight of Endeavour – Press Kit" (PDF). NASA. April 2011. pp. 51–53. Retrieved 22 June 2015. ^ "Remote Manipulator System: About Kibo". JAXA. 29 August 2008. Archived from the original on 20 March 2008. Retrieved 4 October 2009. ^ "International Space Station Status Report #02-03". NASA. 14 January 2002. Retrieved 4 October 2009. ^ "MLM (FGB-2) module of the ISS". RussianSpaceWeb. Retrieved 16 June 2014. ^ Freudenrich, Craig (20 November 2000). "How Space Stations Work". Howstuffworks. Retrieved 23 November 2008. ^ "5–8: The Air Up There". NASAexplores. NASA. Archived from the original on 18 December 2004. Retrieved 31 October 2008. ^ Anderson, Clinton P.; 90th Congress, 2nd Session; et al. (30 January 1968). Apollo 204 Accident: Report of the Committee on Aeronautical and Space Sciences, United States Senate (PDF) (Report). Washington, D.C.: US Government Printing Office. p. 8. Report No. 956. ^ Tariq Malik (15 February 2006). 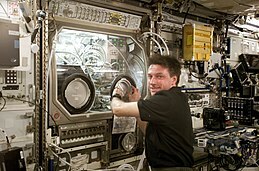 "Air Apparent: New Oxygen Systems for the ISS". Space.com. Retrieved 21 November 2008. ^ a b Patrick L. Barry (13 November 2000). "Breathing Easy on the Space Station". NASA. Archived from the original on 21 September 2008. Retrieved 21 November 2008. ^ RuSpace | ISS Russian Segment Life Support System. Suzymchale.com. Retrieved 8 October 2011. 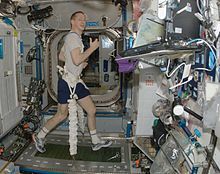 ^ Breathing Easy on the Space Station – NASA Science. Science.nasa.gov (13 November 2000). Retrieved 8 October 2011. ^ "The early history of bifacial solar cell_百度文库". Wenku.baidu.com. 25 October 2010. Retrieved 14 August 2012. ^ Garcia, Mark (28 April 2016). "Facts and Figures". NASA. Retrieved 24 May 2017. ^ G. Landis and C-Y. Lu (1991). "Solar Array Orientation Options for a Space Station in Low Earth Orbit". Journal of Propulsion and Power. 7 (1): 123–125. doi:10.2514/3.23302. ^ Thomas B. Miller (24 April 2000). "Nickel-Hydrogen Battery Cell Life Test Program Update for the International Space Station". NASA. Archived from the original on 25 August 2009. Retrieved 27 November 2009.